The summer season is always a prime opportunity to try out new recipes using homegrown produce from your own backyard. I recently posted a picture on Facebook of my sliced up cucumbers and tomatoes that I had just picked out of my garden. After seeing my picture, one of my friends asked to swap a couple of my cucumbers for a batch of her green beans. There’s nothing better than sharing the fruits of your labor with a friend. 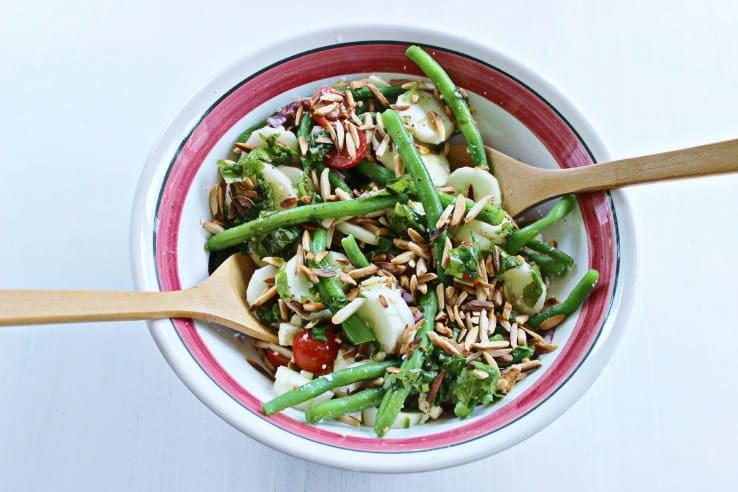 I wanted to switch up the tried-and-true steamed green beans for something different and refreshing. That’s when I came up with this Green Bean Cucumber Salad. Only 3 Weight Watchers Points Plus Value per serving and so healthy! 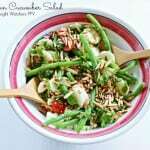 I needed inspiration, so I found this Green Bean Salad Recipe on Food Networks’s website. Really the only thing I changed on Jamie Deen’s recipe was to add the cucumbers. Boil a large pot of salted water. Add the green beans and cook until tender crisp, 1 to 2 minutes. Rinse green beans in cold water in strainer. Pat dry green beans and place in a large bowl. 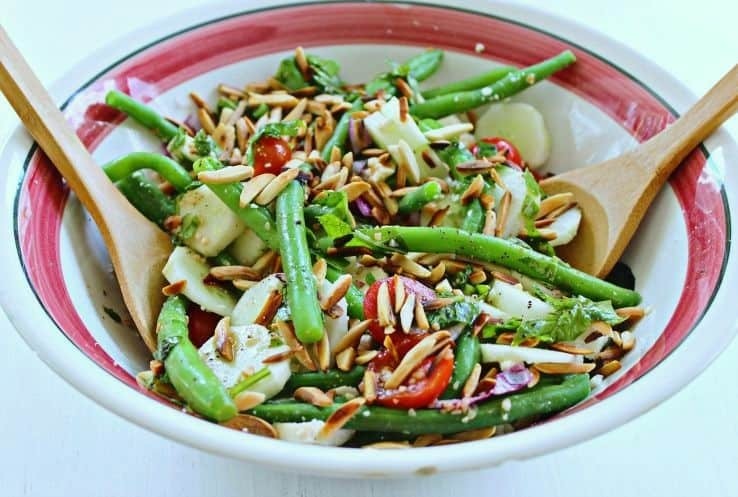 Combine green beans with feta cheese, tomatoes, red onions, & cucumbers. Whisk together the olive oil, red wine vinegar, basil, garlic and some salt & pepper. 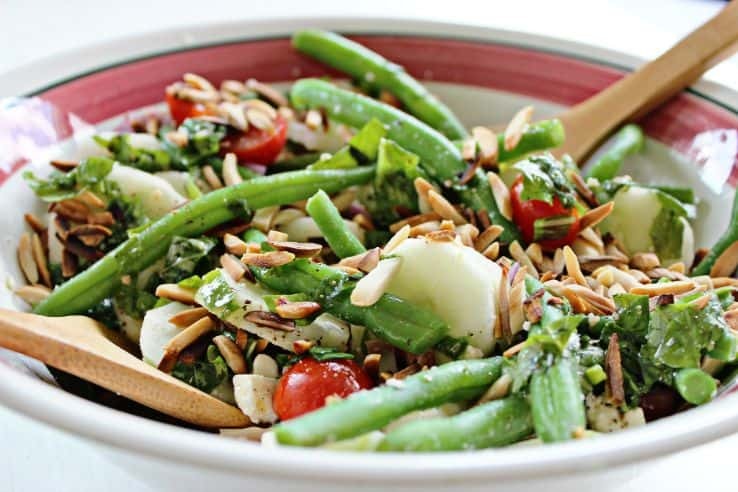 Pour the dressing over the green beans and sprinkle with the toasted almonds. Marinate in the refrigerator for 1 hour before serving. I couldn’t wait to try out this salad. I brought it over to our neighbor’s house for dinner that night and everybody loved it. 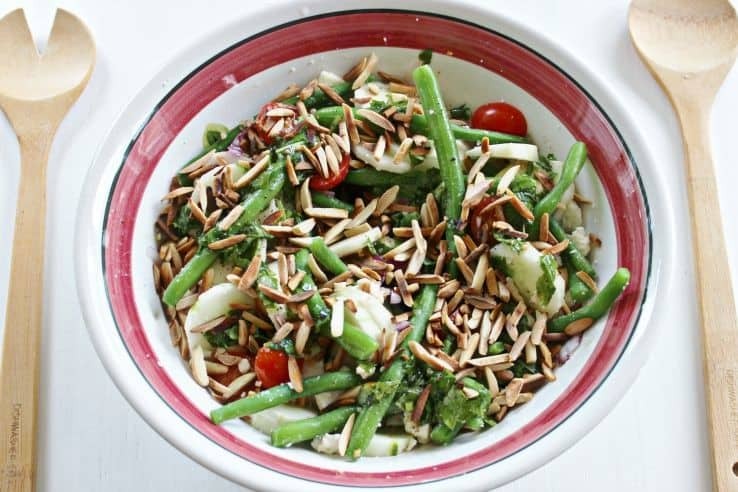 The toasted almonds really add a nice flavor to the salad. 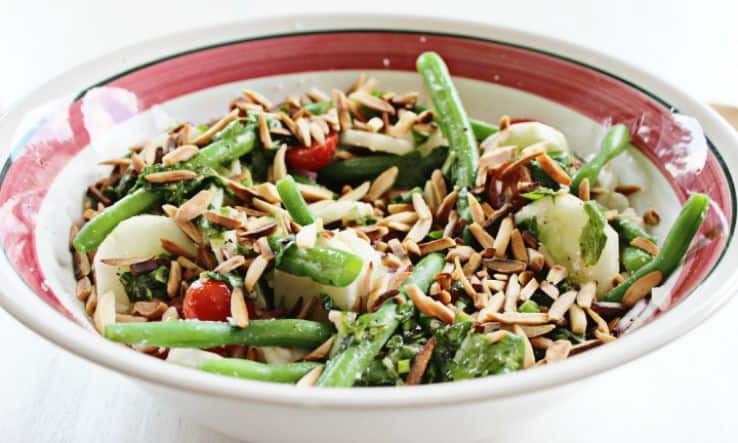 If you prefer a more subtle nutty taste to your salad, you can opt for sliced vs. slivered almonds. Making this type of salad is wonderful in so many ways because it lasts much longer in the refrigerator than a basic garden salad. It’s also much more interesting with all of the different combined flavors and textures. AND it’s WAY more healthy than just some lettuce with a few veggies thrown in. The red wine vinegar, basil, garlic, and olive oil combo provided the perfect flavoring to the salad. Yet another reason why I love summer and all it has to offer! What types of salads do you make during the summer months?